May Blog Hop: Mother’s Day Gift Ideas! So it’s time once again for another Blog Hop! I’m part of a fabulous facebook group of beauty bloggers and each month (on the 1st) we all post about the same theme. This month features Mother’s Day Gift Ideas. Since subscription boxes are my specialty I’m going to feature some boxes along with some gifts you can wrap up in a pretty bow. For the Mom who enjoys makeup, beauty products, pampering and all things feminine. This box features 5 full size luxury beauty products each month in a pretty box. I think the fact that this box includes full sizes makes it perfect for gift giving. There’s a wide variety of brands featured and they are high end. For the Mom who loves travel and enjoys everything from an RV trip to a fancy cruise. This is a brand new travel box on Quarterly from the blogger at Hitha On The Go. Quarterly describes her as “Hitha is on a mission to teach women how to travel in style with only a carry-on (yes, no matter how long the trip). A road warrior with an addiction to shoes, she went from checking her massive, overstuffed suitcase to breezing through the airport, with only her 22” suitcase in hand.” Sounds like the perfect sub for those Moms who are always packing for their next trip. There is nothing that makes travel smoother than nice luggage. I love the Samantha Brown line that is available on HSN. They have lots of wonderful colors and configurations and there are sets for everything from a weekend away to a month long cruise. 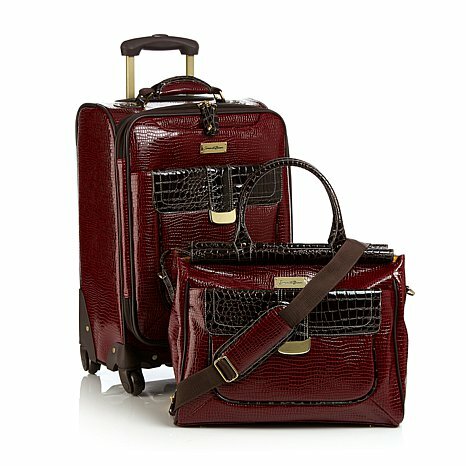 This set is classy and durable and the perfect size for a small getaway or to use as your carryon and purse. For the Mom who believes that love = food and insists on hosting all the holiday parties. As someone who’s spent a lot of time studying the contents of Fancy boxes, I can assert that this is one of the best and most consistent they send out. It has great food, kitchen and home items. For anyone who enjoys cooking and entertaining this would be a great choice. This is the box from that crazy food and travel guy who eats things like dried scorpions. His box features food items from all over the world and each box typically revolves around a certain region. They are the perfect option for a cook with a penchant for global cuisine. For a detailed review of the last Andrew Zimmern box, head over here. I highly recommend that if someone enjoys cooking they invest in ceramic bakeware. It’s non-stick, and can go from the oven to the freezer, fridge or dishwasher, plus it’s microwave safe and when you pick up a pretty pattern like the one above, you can even serve in it. QVC has a fabulous line of ceramic bakeware called Temp-tations and it comes in all kinds of awesome patterns and configurations. If your mom loves cooking and collecting stuff, she’ll probably have a fun time getting all the different baking pieces and dinnerware. So what are you getting your Mother this Mother’s day? And if you’re a mom, what would you love to be surprised with? If you enjoyed this post, please stop by and visit some of my other blog-hoppers and read their take on Mother’s Day gifts. 6. Ashly from Reviews / Ramblings & Randomness! Previous article	← April Product Review: Garlic Gold! There is a Tyler Florence Fancy Box?????? That’s awesome! And from what I’ve seen the contents are consistently great, which is not the case with most Fancy boxes. OMG..I’m drooling over the luggage pick! 🙂 I’ve been eyeing that line from HSN for a while – but haven’t tried it…yet! I have the accessory case and the jewelry case (I use one for toiletries and the other for both jewelry and accessories). They are super well made and I love them. 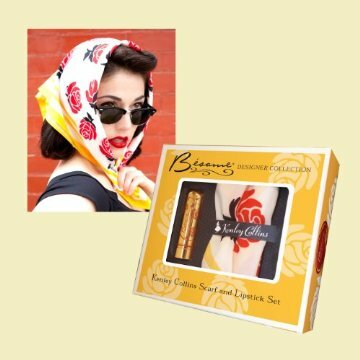 I love the scarf and lipstick idea from Besame! It’s so pretty and feminine! Me too! I’ve been wanting to try Besame since I saw it on Karen’s blog for the Roadtrip Blog Hop. This is such a clever idea! I love gifting subscription boxes! I’ve given my sister a Beauty Box 5 subscription for 3 months when she first went off to college and both my mom and sister a 3 month subscription to Birchbox for Christmas last year. Temptations bake ware is AMAZING! I personally have a zillion of their products; I’m partial to their red and white polka dot pattern. Thanks for the awesome post! Man I want those straight to table cookware!!! Me too! If I had the kitchen space I’d pick up a nice big baking set. What a good idea to give a box subscription! I’ve done that for friends, but you’re right: it’s perfect for moms too 🙂 Plus, how cute it that lipstick and scarf set?! What great ideas! Awesome ideas! That bake ware is super cute!